Go Pack Go! Home that is. 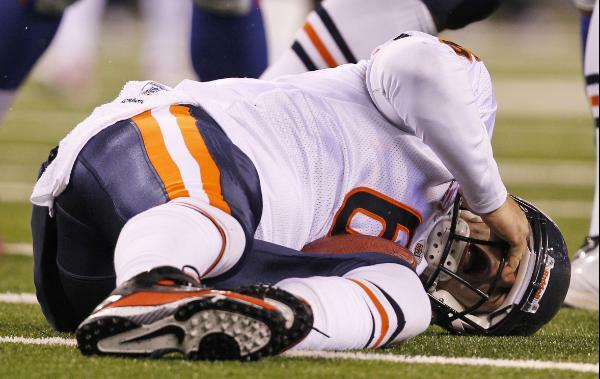 A game where both teams played poorly, the Bears managed to get a patented “Lovie takaway” at the right time to pull out a victory. Here’s a few tidbits of the game. * He’s baaaack. Devin Hester, you are ridiculous! One of his returns set up a FG, and another he took to the house. Packers punter Tim Masthay bombed a huge kick out of his own endzone, only to out-kick his coverage team. Oh, and putting it in the center of the field for Devin to navigate wasn’t the best of ideas either. * And again, how do you stop Julius Peppers? You hold him. At least 4 of them got called this time. Could have easily been another 5-6 called. He also caused 3 false starts, and was also responsible for the brown stains in Tauscher’s and Clifton’s pants. * The Bears might be the only team that opponents actually fear kicking FG’s against. Busting up through the middle, mean machine Peppers got his 10th career field goal block against Mason Crosby. * Did anyone notice the 2 huge dents around midfield? Those were from AJ Hawk getting planted first by Devin Hester on a Cutler to Knox completion, and the other he was smoked by Kellen Davis on Hester’s punt return. * I didn’t like that Cutler showed glimpses of “bad Rex” from last year. The bad throws into coverage off your back foot will almost never have a good result. Please stop doing that. Thanks. * But I did enjoy when Cutler scrambled down the right sideline, then cut back in only to break Frank Zombo’s ankles in the process. First down! * Tim Jennings played pretty well when his name was called. It’s nice to know that they’ll be ok if an injury happens to Bowman or Tillman. * I actually saw DJ Moore hit someone! Mind you, it wasn’t very hard and Urlacher had to clean it up, but I’ll take it. With that being said, can we get Jennings in at nickel please? * Lovie benched Tommie Harris for his lack of production. Ok, now let’s bench Mark Anderson for his. Hello, Corey Wootton. * Henry Melton has had some nice plays. Problem is, Lovie has him playing DT in pass rush situations. Stop it, and get him out at DE please. Put Idonije at DT in those situations. * J’Marcus Webb filled in for Shaffer for a few series. Man, he’s big. He looked pretty comfortable out there, but still a rookie. Glad he got his feet wet. Looks like he may be the Bears future starter at tackle. * Very proud of the Bears fans that were in attendance on Monday Night. We were extremely loud and the Bears D fed off of it, while the Packers offensive line struggled. Nicely done! * One last thing. To all the people that say “the better team didn’t win.” So you’re telling me the “better team” that night was the one so undisciplined that they committed 18 penalties, 2 turnovers, had no running game, and has a special teams unit that had a FG blocked and gave up a punt return? Oh, ok. Gotcha.